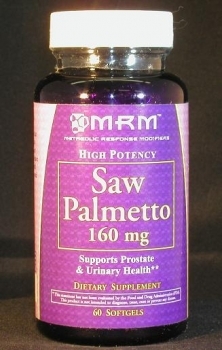 Saw-Palmetto-Oil — for people who want to be sexier than they already are. Saw Palmetto is an extract from berries of the American dwarf palm tree Serenoa repens. Crude Saw Palmetto extracts have been traditionally used to improve sperm production, sexual vigor, and to increase breast size. Despite their good theoretical basis, these uses have been ignored by the medical establishment. On the other hand, a 1000-patient study showed Saw Palmetto to be as effective as finasteride (Proscar®) for the treatment of benign prostatic hyperplasia — excessive prostate growth promoted by the hormone dihydrotestosterone (DHT). Saw Palmetto inhibits the enzyme which produces DHT from testosterone — thereby lowering DHT levels and producing modest increases in testosterone levels.